· The ground-breaking ceremony for the giant Diamer-Bhasha Dam has already been carried out five times in the last fifteen years. The project cost is more than USD 14 billion, it has already caused bloody clashes for land compensation between local tribes, and may have a lot of other far-reaching negative consequences . · “Pakistani firms have been denied contracts for power and other projects… equipment and labor are coming from China.” Abdul Razak Dawood, the CEO of a leading Pakistani company Descon Engineering, lamented in January 2018, after his firm lost to Chinese competitors in 5 tenders. According to the Diplomat, this was one of the rare cases of a Pakistani businessman’s criticism of his country’s preferential treatment of Chinese companies. · In July 2018 the party of cricket-player Imran Khan won national election, partly due to popular resentment to unequal Sino-Pakistani relationships. 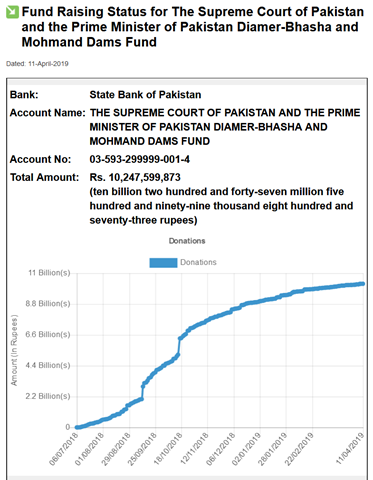 · In the same month the Chief Justice of Pakistan (CJP) Mian Saqib Nisar, after hearing expert testimony on looming water crisis, launched a $12.4bn fundraising campaign for building two mega-dams first designed 50-years ago. He marketed that idea to the public as the main and only means to solve the problem of water shortage. · The new Prime-Minister Imran Khan joined the populist campaign for dam donations. “Pakistanis, do take part in this jihad,” the prime minister Imran Khan urged Pakistanis at home and abroad..
· The Chief Justice of Pakistan (CJP) Saqib Nisar warned on September 5, 2018 that whoever tries to hinder the construction of Diamer-Bhasha and Mohamand Dams will be tried under Article 6 of Constitution of Pakistan for "high treason". 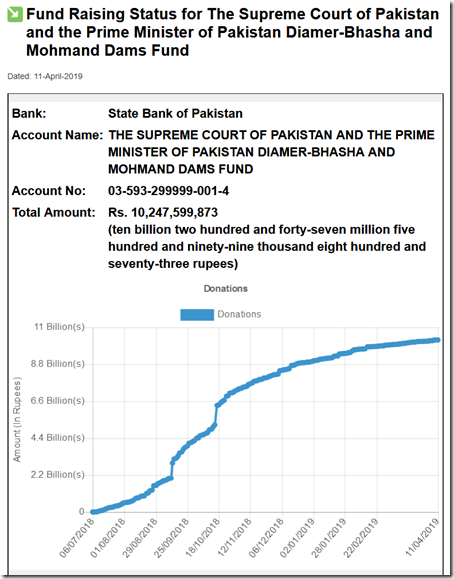 Moreover, the Chief justice ordered a litigant to pay 1 million Pakistani rupees ($8,115) into the dam fund if he wanted his request for an adjournment to be granted, several other such cases followed. · To silence critics, who ridicule his fundraising effort, the Chief Justice Nisar, just before leaving the office, on January 9, 2019 issues an order that this court will take action if media run any "malicious campaign against the construction of dams". · Facing decrease in donations to dam fund the PM Khan appeals to overseas Pakistani to contribute and sends his officials to various countries to implement fundraising campaign. · In early 2019 the Water and Power Deve­lopment Authority (WADPA) has awarded the contract worth Rupees 183.523 billion for civil and electro-mechanical construction works at the Mohmand Dam Project to a joint venture between China Gezhouba Group of Companies (CGGC) and Descon Pakistan (the Voith Hydro also involved according to press). Project full cost estimated at USD 2,2 billion and promised time of completion is spring 2024. Mohmand dam will store 1.48 cubic kilometers of water and generate 740 MW electricity besides irrigating 7,000 hectares of land. The project will also help protect Mardan, Charsadda, Peshawar and other areas from floods during monsoon season. · The opposition parties pointed to a conflict of interest as WADPA awarded the project to Descon, which is owned by Adviser to Prime Minister Abdul Razak Dawood and his family. The contract has been awarded without competition to a single bidder, with another bidder disqualified half-way through the process. According to some sources the inauguration ceremony of Mohmand hydro power dam was shelved due to the controversy on the issue of award of the contract of project. · On April 2, a joint venture between China Gezhouba Group and Pakistani Descon signed a $1.86 billion contract with the Pakistan Water and Power Development Authority (WAPDA) for the 740MW Mohmand Dam hydropower project in Khyber Pakhtunkhwa province. · On April 10, 2019 the Attorney General for Pakistan (AGP) Anwar Mansoor Khan complained to the Supreme Court about the behavior of the media which are criticizing the government for award of contract to one of the contractors namely DESCON, allegedly owned by Adviser to Prime Minister Abdul Razzaq Daud. He said that, since the court on January 9, barred the media to scandalize dam construction matters, he requested judges to act accordingly. As we see from this story, the crowd-funding campaign was used as propaganda tool, while the real money for mega-dams come from the coffers of Pakistan government, which will then have to borrow from international sources. Then this money end up in the pockets of Chinese state-owned corporations and Pakistani companies affiliated with ruling elite…. If anyone has a different hypothesis of what is happening – we are ready to publish it.